Third District Board Member Alexie Tutor who has been rumored to seek higher office in the 2019 elections remained coy on her political plans even as hopeful candidates have slowly made their way into public view and announced their candidacies ahead of the polls. 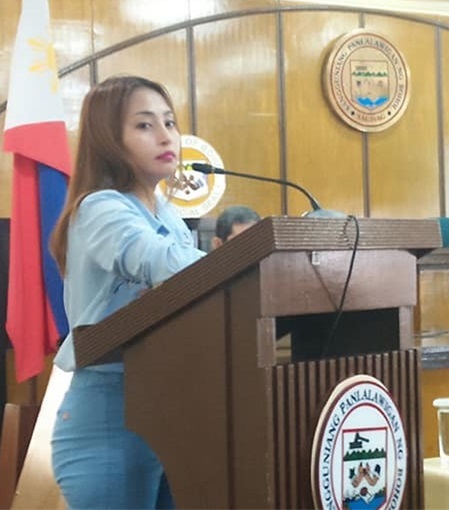 Tutor, who garnered the most votes in her district and the entire province during the 2016 Provincial Board race, shunned commenting on her purported congressional bid. “No comment ug wait and see lang sa…hapit na bitaw October,” said Tutor regarding the weeklong filing of certificates of candidacy next month. Tutor was earlier named as among possible candidates in a four-way battle for the congressional seat of the third district which will be left vacant by last-term Representative Arthur Yap. Should Tutor run for the post, she will possibly go up against businesswoman Conchita Toribio-Delos Reyes, retired Mandaue judge Caloy Fernando and Vice Governor Dionisio Balite. Both Delos Reyes and Balite have publicly announced their congressional bids. According to Tutor, some mayors and other officials in the district’s towns have pledged support for her should she run for the congressional seat. Tutor who is the wife of Candijay Mayor Christopher Tutor is on her first term as Provincial Board Member. She is the chair of the Sangguniang Panlalawigan’s committee on tourism.